In 1955, at the age of 18, Bhikkhuni Shao Hong went to Jingxiu Yuan, Xizhi to study under Master Xiu Guan. In 1957, at the age of 20, she went to Sanzang Buddhist Collegge at Shipu Temple to study Buddhist doctrines under Elder Bai Sheng. She ordained as a Bhikkhuni in 1959. In 1963, she went to Haishan Temple, Taitung to stay with and study under Dharma Teacher Xiu He. Bhikkhuni Shao Hong has spread the Dharma far and wide and consistently engages in charitable activities. She founded: the Dharma Protection Committee, Taitung City; the Compassionate Women’s Association, Taitung City; the Haishan Kindergarten for 29 sessions. She hosted Summer Camps in the summertime and Education and Entertainment Camps in the wintertime. On the Buddha’s Birthday, Wesak Day, she organizes annual ceremonies and distributes tuition subsidies, relief grants and emergency aid to needy high school and college students. In 1994 Bhikkhuni Shao Hong was elected as a representative of National Good People and Good Deeds of Taitung County. In 2005, Bhikkhuni Shao Hong founded Haishan Home for Needy Children. In 2010 her meritorious deeds were praised as she was awarded the Outstanding Citizen of Taitung City. 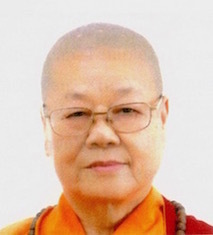 Her former-posts include: Chairperson of the Buddhist Association of Taitung County, and the 2nd and 3rd Chairperson of the Chinese Buddhist Bhikkhuni Association. Currently, Bhikkhuni Shao Hong is the Abbess of Taitung Haishan Temple and Director of the Chinese Buddhist Bhikkhuni Association.